In many areas forage can be deficient in copper. Coppavit provides a complete, balanced, high-specification drench that contains optimal levels of copper, to maintain cow and sheep health. Copper supplementation in sheep and cattle can help towards ensuring healthy livestock, which is why supplementing copper in the diet is so important. Copper drenches such as Coppavit are highly cost effective and easy to use. 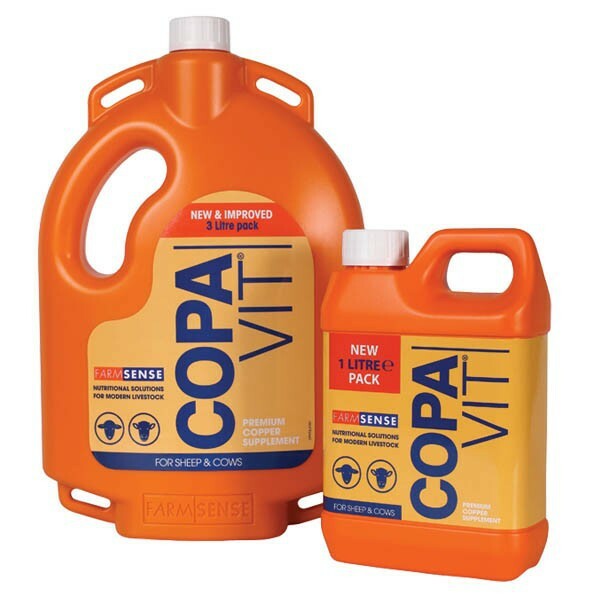 However if choosing not to use drench in cows and sheep, why not try a copper containing mineral bolus such as our Coppavit Bolus – available for lambs, cows, ewes and calves. Administration SHAKE WELL BEFORE USE. Administer as a drench having first checked the applicator for safety and accuracy. Repeat as required, but at no less than 4-6 week intervals. Warnings POISONOUS due to high copper content. Not for human consumption. For feeding to animals only. DO NOT FEED OTHER SOURCES OF COMPLEMENTARY COPPER TO SHEEP. Health & Safety If accidentally ingested seek medical advice. Use Many areas in UK pastures are deficient in copper. COPPAVIT® is an easy to use liquid supplement that can quickly and effectively rectify any imbalance. Packaging 1 litre and can.